Advanced formula inflammation reducer and pain reliever. The unique combination of Curcuma Longa Extract (curcumin) and Black Pepper extract (piperine) ensures high absorption and assimilation of the turmeric and enhances its active effect over time within the body. These are enteric coated tablets that prevent release in the stomach and ensure release and absorption in the intestine, to improve the formula's effectiveness. Turmeric is a yellow spice and a member of the ginger family. Turmeric is widely used in food preparation and is commonly used in traditional Indian medicine (Ajurveda) and has helped treat diverse medical problems for many years. Turmeric's therapeutic activity has been attributed to the plant's active ingredient, Curcumin. Curcumin is essentially the pigment which gives Turmeric its yellow color and also characterizes its distinct aroma. Curcumin has been studied a great deal and over 2600 articles have been published on the subject, with the vast majority of publications published in recent years. Curcumin has been revealed to be the performer of diverse biological tasks; it was discovered that curcumin has strong anti-inflammatory, anti-cancer and even anti-depressant activity. Black pepper contains an ingredient called piperine which increases biological availability of curcumin by 2000 percent!!!!!! 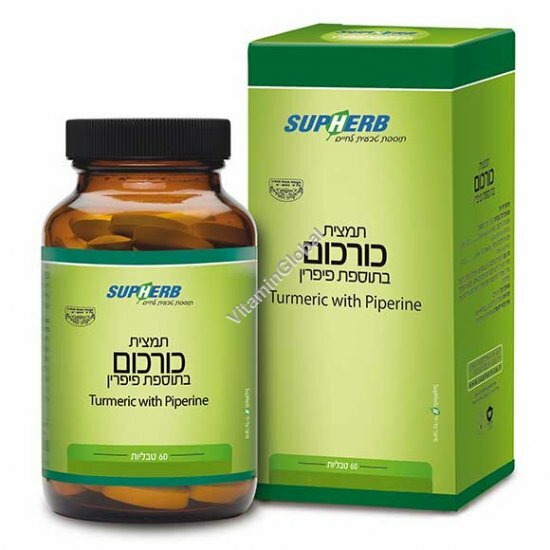 Adding piperine to turmeric enables the maintenance of high levels of curcumin in the blood, increases the penetration of curcumin through the cells and delays the secretion of curcumin outside the body. 1-2 tablets a day with a meal. Not recommended for those taking Coumadin. Package quantity: 60 coated tablets.